Presenter: Francis Lacombe, M.D., Ph.D., is head of the hematology/automation laboratory and director of flow cytometry at the Université Hôpital, Haut-Lévêque, Pessac, France. Dr. Lacombe serves as a member of Société Française d'Hématologie, Groupe Français d'Hématologie Cellulaire, Association Française de Cytométrie and Groupe d'Etude Immunologique des Leucémies; a counselor for the International Society for Analytical Cytology and the International Society for Laboratory Hematology; an advisor to the CLSI Hematology committee; and an ICSH member. *CE marked; not available for sale in the U.S and other geographies. The opiate crisis has reached epidemic proportions, evidenced by more than 17,000 deaths a year and $504 billion in economic costs in the U.S. alone¹. Healthcare providers and laboratories need highly specific tests that accurately detect drugs of abuse in patient-care, employment, athletic and prescription drug monitoring settings. In this webinar, Dr. Mary Mayo discusses two highly sensitive assays—the Syva® EMIT® II Plus 6-Acetylmorphine (6-AM) and Buprenorphine (BUP)—that expand available options for drugs-of-abuse testing. Dr. Mary Mayo is a medical affairs manager with Beckman Coulter Diagnostics, with more than 25 years’ experience in the clinical laboratory. This includes twelve years as a laboratory director, nine years as director of clinical chemistry at a tertiary-care academic hospital and three years as the laboratory director of a commercial laboratory. ¹ CDC. “Opioid Overdoses Treated in Emergency Departments.” https://www.cdc.gov/vitalsigns/opioid-overdoses/. Accessed 6 Mar 2018. *Beckman Coulter Inc. is approved as a provider of continuing education programs in the clinical laboratory sciences by the ASCLS P.A.C.E.® Program. These credits are recognized by the State of California. Most programs also provide State of Florida credits (with valid license number). At this time, we cannot issue continuing education credits for those who provide healthcare (or work for an institution that provides healthcare) in Massachusetts or Vermont. Barbara L. Zimmer discusses trends in antibiotics and resistance, and the role microbiology laboratories play in staying ahead of their potentially damaging effects, such as longer illness, increased mortality, prolonged hospital length of stay and increased costs. Presenter: Barbara L. Zimmer, Ph.D.
Barbara L. Zimmer, Ph.D., is a principal scientist for Beckman Coulter. She is also a lecturer in mycology and infectious diseases in the Department of Dermatology at the University of California, Davis, School of Medicine. Dr. Zimmer is an advisor of the CLSI Subcommittee on Antimicrobial Susceptibility Testing. She was previously on the Board of Scientific Counselors’ Antimicrobial Resistance Working Group for the CDC and is the past industry advisor to the Microbiology Devices Panel of the Food and Drug Administration. She is the author of more than 30 papers and 130 posters and has presented approximately 100 scientific workshops. In the AU Analyzer Advanced Troubleshooting webinar, the Reliability Improvement Team shares advanced troubleshooting techniques that can help laboratories ensure uptime and reliability of their AU chemistry analyzers. The helpful tools presented during this webinar are based on customer feedback gathered from technical support calls and field service support visits with technologists using our AU systems. Lisa Hammett holds a B.S. degree in medical technology from the University of Texas at Austin. For almost a decade, Lisa has served as a senior analyst in chemistry product management marketing with Beckman Coulter, specializing in AU chemistry systems. Prior to Beckman Coulter, Lisa served for 16 years as a course developer and customer trainer for AU analyzers with Olympus. Is your clinical laboratory facing increased workloads and complicated workflows? Extensive documentation requirements affecting QC? Need to bridge talent gaps? In this webinar, your peers from El Camino Hospital will share how they addressed those challenges through IT middleware solutions. Antimicrobial resistance exhibits remarkable diversity in the European population, providing opportunities to explore both trends and testing. In this presentation, Professor Gian Maria Rossolini offers an overview of the current state of antimicrobial resistance—and detection—in the region. Gian Maria Rossolini is a professor of microbiology and clinical microbiology at the University of Florence, and director of the clinical microbiology and virology unit of Florence Careggi University Hospital. Previously, Prof. Rossolini served as professor of microbiology and clinical microbiology at the University of Siena, where he acted as chairman of the Department of Molecular Biology and as dean of the medical faculty. MICs play a significant role in antimicrobial susceptibility testing. In this presentation, Professor Emilia Cercenado examines the importance of accurate MICs in routine testing, particularly for treatment of infections, appropriate use of antimicrobials and detection of resistance. Professor Emilia Cercenado is the staff senior specialist in microbiology and parasitology at Hospital General Universitario Gregorio Marañón in Madrid, Spain, and an associate professor of microbiology at the Complutense University, also in Madrid. Prof. Cercenado has a Pharm. D. and has held a research fellow position at the University of California at Los Angeles and Harvard Medical School. Prof. Cercenado has co-authored over 340 publications and serves as associate editor of Enfermedades Infecciosas y Microbiologia Clinica. Presenter: Dr. Sautter is a teacher, lecturer and industry consultant. He earned his B.S. and M.S. degrees from Eastern Michigan University in the areas of biology and molecular biology, respectively, and his Ph.D., from Wayne State University, in Detroit, Mich., in microbiology. During his career, he held positions as a medical technologist, director of microbiology and medical director for a number of laboratories, before becoming an esteemed consultant for a variety of industry leaders in the area of microbiology. Continue the discussion with AU service and support professionals and discover more proven strategies for improving the uptime and reliability of your AU chemistry analyzers. Note: To attend the webinars, you must register for both Part 1 and Part 2. *Beckman Coulter, Inc. is approved as a provider of continuing education programs in the clinical laboratory sciences by the ASCLS P.A.C.E.® Program. These credits are recognized by the State of California. Most programs also provide State of Florida credits (with valid license number). At this time we cannot issue continuing education credits for those who provide healthcare (or work for an institution that provides healthcare) in Massachusetts or Vermont. Join us for this two-part webinar series designed to help you improve the uptime and reliability of your AU chemistry analyzers. When errors pass through laboratory tests undetected, patients may suffer. What if one of the tests your laboratory performs frequently is also the one most commonly at risk for error? Consider patients who present with symptoms of anemia. Clinicians confer the highest importance to hemoglobin (Hgb) measurement. This is because this parameter can directly reflect patient quality of life, independent of any underlying disease that may cause the anemia. Hence, there is a need for quality assurance (QA) measures that ensure Hgb testing reliability. The “rule of three” contributes largely to this end. *Beckman Coulter, Inc. is approved as a provider of continuing education programs in the clinical laboratory sciences by the ASCLS P.A.C.E® Program. These credits are recognized by the State of California. Most programs also provide State of Florida credits (with valid license number). At this time we cannot issue continuing education credits for those who provide healthcare (or work for an institution that provides healthcare) in Massachusetts or Vermont. Hear Jack Montgomery share his experiences and methodologies in applying sigma analysis to lab quality control at Asante Health, a Truven Health Analytics Top 100 hospital the past four years. In this webinar, Jack will discuss the dynamic nature of sigma metrics for clinical chemistry analytes. He will show how they can be improved over time with enhanced monitoring and optimized maintenance schedules. This sensitivity of sigma metrics highlights the notion that sigma methodology is just one of the many tools that should be used for a holistic approach to lab quality. Jack Montgomery, MLS(ASCP)cm, is the chemistry technical specialist for Rogue Regional Medical Center—the flagship entity for Asante Health—a growing three-hospital system located in southern Oregon containing a laboratory accredited by the College of American Pathologists. Jack has over 40 years of experience in the clinical laboratory with a special interest in quality control, sigma metrics and method validation. Gert-Jan van de Geijn, Ph.D. In this on-demand webinar, Dr. Gert-Jan van de Geijn, renowned hematology expert, researcher and industry leader, discusses new chronic obstructive pulmonary disease (COPD) test parameters that better discriminate between bacterial and nonbacterial acute exacerbation. Dr. van de Geijn shares how neutro/lympho ratios and basophils (measured by flow) combined with current C-reactive protein (CRP) tests enable more accurate bacterial detection in COPD patients. For more insight, watch a recorded Q&A session that followed the live webinar. Gert-Jan van de Geijn, Ph.D., has nearly 20 years of experience in hematology and laboratory medicine. He is a specialist in multiple technologies related to cellular analysis, including both flow cytometry and molecular biological techniques. He has published and contributed to more than 30 research articles. Currently, Dr. van de Geijn is a research coordinator for the Department of Clinical Chemistry at Franciscus Gasthius Hospital, Rotterdam, the Netherlands. *Beckman Coulter, Inc. is approved as a provider of continuing education programs in the clinical laboratory sciences by the ASCLS P.A.C.E.® Program. These credits are recognized by the State of California. At this time, we cannot issue continuing education credits for those who provide healthcare (or work for an institution that provides healthcare) in Massachusetts or Vermont. Dr. Crawford is an internationally renowned urologist and distinguished endowed professor of surgery, urology and radiation oncology. He also serves as the head of the section of urologic oncology at the University of Colorado Anschutz Medical Campus in Aurora, Colorado. Dr. Crawford received his medical degree from the University of Cincinnati. His postgraduate training included an internship and residency in urology at the Good Samaritan Hospital in Cincinnati. He subsequently completed a genitourinary cancer fellowship at the University of California Medical Center in Los Angeles. Are you having difficulty categorizing urine sediment particles due to operator subjectivity? Automating urine sediment microscopy can help standardize particle characterization. In the final installment of our miniseries, Dr. Michael Samoszuk presents automated and manual microscopy study data from Dr. Sorin Gîju, clinical chemist at the Clinical Emergency Hospital in Timisoara, Romania. Dr. Samoszuk compares results from the iRICELL3000 automated microscopy system and manual microscopy for the same patient samples. The iRICELL3000’s proprietary Digital Flow Morphology technology captures 500 images per sample and offers 12-particle classification, resulting in fewer opportunities to miss urine particles. Watch this webinar to enhance your understanding of your urinalysis results. Dr. Michael Samoszuk, M.D., vice president and chief medical officer of Beckman Coulter Diagnostics is a graduate of Harvard Medical School, Boston, and completed his postgraduate training at Brigham and Women's Hospital, Boston; University of California, San Francisco; and University of Southern California, Los Angeles. As an experienced chief medical officer, director of hemapathology and associate professor of pathology and radiology, Dr. Samoszuk contributes his expertise to Beckman Coulter’s diagnostics division. His guidance supports product and process developments as well as performance enhancements with patients and clinicians in mind. Dr. Guido Vranken and Lobke Tremmerie discuss how to implement Bulls XB algorithm, which uses RBC indices to create a weighted moving average of patient sample results, to statistically monitor hematology results. This unique algorithm, offered on Beckman Coulter hematology instruments, allows users to monitor result quality without additional reagents, software licenses or costs. Laboratories worldwide can implement this simple, powerful tool to enhance results and improve compliance. Presenters: Guido Vranken, Ph.D, has been working with customers for over 30 years across different disciplines, including protein chemistry, immunoassay and hematology. He specializes in conducting internal and external validation studies. Dr. Vranken spent three years as a lecturer on statistics at the University of Ghent. Lobke Tremmerie earned her environmental engineering degree from the University of Ghent in 2002. She first became an electrophoresis and nephelometry sales engineer at Analis, Beckman Coulter’s exclusive Belgian distributor. Following her true passion, she transferred into the hematology division in 2004. Ms. Tremmerie currently serves as Analis’ cellular biology product marketing manager. How do you know when your result parameters are set to their most efficient ranges? In part two of our three-part webinar series, Dr. Michael Samoszuk highlights the correlative relationships between urine chemistry data and urine microscopy data on Beckman Coulter’s Iris iRICELL3000. Learn how these correlations can help you optimize the customizable auto-release function and reduce your laboratory’s manual workload. Michael Samoszuk, M.D., vice president and chief medical officer of Beckman Coulter Diagnostics, is a graduate of Harvard Medical School, Boston, and completed his postgraduate training at Brigham and Women's Hospital, Boston; University of California, San Francisco; and University of Southern California, Los Angeles. As an experienced chief medical officer, director of hemapathology and associate professor of pathology and radiology, Dr. Samoszuk contributes his expertise to Beckman Coulter’s diagnostics division. His guidance supports product and process developments as well as performance enhancements with patients and clinicians in mind. Michael Samoszuk, M.D., vice president and chief medical officer of Beckman Coulter Diagnostics, is a graduate of Harvard Medical School, Boston, and completed his postgraduate training at Brigham and Women's Hospital, Boston; University of California, San Francisco; and University of Southern California, Los Angeles. As an experienced chief medical officer, director of hemapathology and associate professor of pathology and radiology, Dr. Samoszuk contributes his expertise to Beckman Coulter’s Diagnostics His guidance supports product and process developments as well as performance enhancements with patients and clinicians in mind. Superbugs are a significant health threat in the U.S. and around the world, making proper detection more important than ever for both patient care and infection control. In this webinar, Dr. Barbara L. Zimmer discusses the mechanisms of resistance that are most concerning to the Centers for Disease Control. Get an in-depth review of the classes of beta-lactamase resistance found in Enterobacteriaceae and the challenges associated with detection in the laboratory. Dr. Zimmer will also cover new resistance mechanisms such as mecC-mediated MRSA, colistin-resistant Enterobacteriaceae and antibiotic-resistant Candida species. Presenter: Barbara L. Zimmer, Ph.D., is a principal scientist of scientific affairs for Beckman Coulter microbiology. She is also a lecturer in mycology and infectious diseases in the department of dermatology at the University of California, Davis, School of Medicine. Dr. Zimmer is a voting member of the CLSI Subcommittee on Antimicrobial Susceptibility Testing. She was previously on the Board of Scientific Counselors Antimicrobial Resistance Working Group for the CDC and is the past industry advisor to the Microbiology Devices Panel of the Food and Drug Administration. She is the author of over 30 papers and 130 posters and has presented more than 100 scientific workshops. Beckman Coulter Diagnostics develops clinical diagnostic products that help advance and optimize the clinical laboratory. Beckman Coulter’s instruments, systems and tests help streamline processes to enhance efficiency, reduce costs and speed the delivery of results. 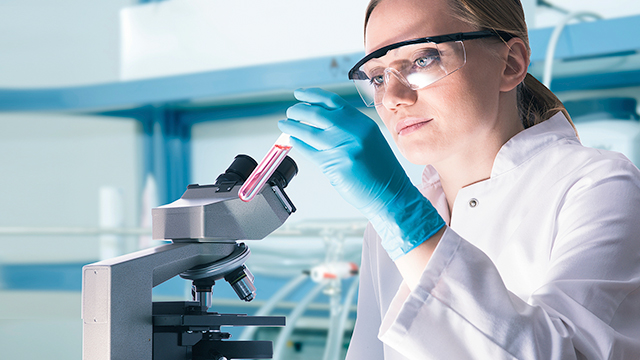 For more than 75 years, Beckman Coulter has been a global leader devoted to providing solutions to laboratories of all sizes – offering a broad portfolio of chemistry, immunoassay, hematology, urinalysis, automation and information systems. Beckman Coulter is, and always has been, singularly devoted to moving science, innovation and the lab forward.